WASHINGTON — The Postal Service is getting ready to honor the nation’s brave and loyal military service dogs later this year. 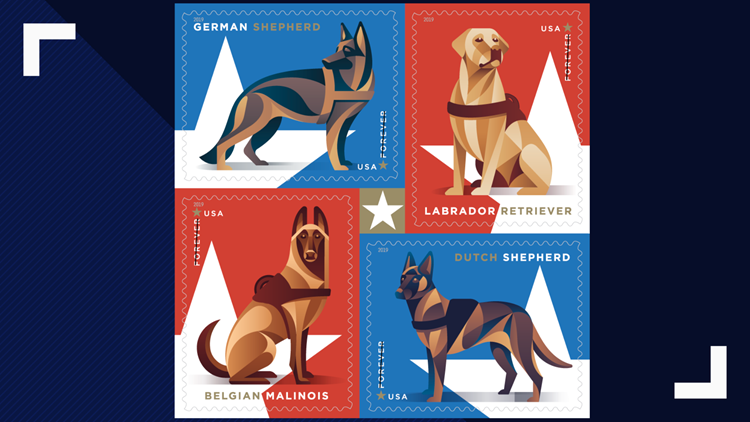 The Forever Stamps feature images of either a German shepherd, Labrador retriever, Belgian Malinois or Dutch shepherd. These are all breeds that commonly serve in the United States Armed Forces. "The stylized digital illustrations are in red, white, blue and gold to represent the American flag and patriotism," a Postal Service news release said. The new designs come in books of 20 stamps, which will now set you back $11 based on the USPS new Forever Stamps price of 55 cents. The postal service also unveiled four other stamp designs to roll out in 2019. One design is the Star Ribbon, which the postal service says is "designed to meet the needs of business mailers." There are also designs honoring women's tennis champion Maureen Connolly Brinker, 10 stamps showcasing works from artist Ellsworth Kelly and three stamps to mark the 150th anniversary of the completion of the transcontinental railroad. You can find out more about the new stamp designs here.